Approximately 28 million Americans have some degree of hearing loss, and the number is expected to reach 78 million by 2030. It is the third most common health problem in people aged 65 to 85, affecting 40% to 80% of the elderly. Children are also affected, primarily due to middle ear infections (otitis media). Noise: Continued exposure to loud music through headphones, concerts, machinery, lawn mowers or everyday city noises is the most common cause of a loss in hearing over time. It is also preventable with care. Age and heredity: As we age, our hearing is affected by changes in the inner ear, which are usually permanent. Heredity can affect the time of onset and amount of hearing loss. Injury or disease: Injury to the ear, ear infections, a ruptured eardrum or earwax buildup are other conditions that can affect hearing. Frequently misunderstanding conversations, especially if there is background noise. Often thinking people are mumbling. Needing to turn up the volume on the TV so loud that it annoys others. Hearing a ringing, buzzing or hissing in your ears (Tinnitus). Feeling that your ears are stuffed. Itching, pain, or fluid leaking from your ears. A feeling of imbalance or vertigo. Is caused when an abnormal growth surrounds the tiny bones of the inner ear, affecting the mobility of the Stapes bone to conduct sound energy towards the inner ear. Is a benign growth caused by the build-up of skin cells and protein from the ear canal behind the eardrum. The outer ear is lined with a layer of skin that casts off dead cells containing keratin, a protein. This discharge, a component of earwax, occurs normally and is removed when the ears are routinely cleaned. If, however, a bit of this skin penetrates the eardrum — which can occur for a number of reasons — the keratin that continues to be given off by the skin becomes trapped in the middle ear and builds-up over time, resulting in a cholesteatoma. If left untreated, this growth can destroy bones in the middle ear, and lead to permanent, sensorial hearing loss, facial paralysis, meningitis, hydrocephalus, or a brain abscess. The primary goal of treatment is to control the infection, then restore hearing loss. Led by Dr. Neil Sperling, M.D., FACS, the Center’s team of ear specialists, and audiologists (hearing specialists) work together to evaluate each patient’s individual case and devise the appropriate treatment plan for the best possible outcome. Vertigo is a common symptom of many inner ear disorders, but is not itself a disease. People may feel a sensation or illusion of movement, or that their immediate environment is spinning, even though no such movement exists. This is because the ear not only controls hearing, but also communicates with the brain to maintain balance. As a result, disorders of the ear can impact one’s sense of equilibrium, with or without impacting hearing. Balance disorders can be particularly difficult to diagnose. Only a dedicated specialist who has experience with these conditions can find unique treatments for people suffering from vertigo and imbalance. Meniere’s Disease occurs when there is increased pressure on the fluids of the inner ear, which can cause symptoms such as Vertigo, Tinnitus and hearing loss. The combination of elevated pressure and abnormal mixing of inner ear fluids prevents the proper transmission of signals regulating balance between the inner ear and the brain. Currently, there is no known cure but scientists are exploring the causes for increased inner ear pressure, which may include viral infections and environmental factors. The word Tinnitus is derived from Latin and means “to tinkle or to ring like a bell.” Tinnitus is the constant or intermittent sound of ringing, clicking, hissing, buzzing, or roaring heard inside the ear or head and is a common symptom of hearing disorders. It can be caused by wax build-up, sinus or ear infections, misalignment of the jaw, facial nerve tumors, or trauma to the head and neck. Though there is no traditional cure, therapies such as Tinnitus Retraining Therapy and Neuromonics Tinnitus Treatment can help neutralize the bothersome noises. NYOG’s Hearing & Balance Center is one of the few dedicated treatment centers for Tinnitus in the New York area. Staff members work with patients to learn how to “neutralize” the bothersome noise. Currently, these are the most effective treatments available. Otosclerosis (also termed otospongiosis) is a condition caused by abnormal changes in the inner ear bone, resulting in stiffening or fixation of the stapes bone. This hinders its vibrations, causing conductive hearing loss. There is no cure, but treatments are available to help overcome hearing loss, such as hearing aids and surgery. Perforations of the tympanic membrane (eardrum) typically occur from injury or repeated infections. 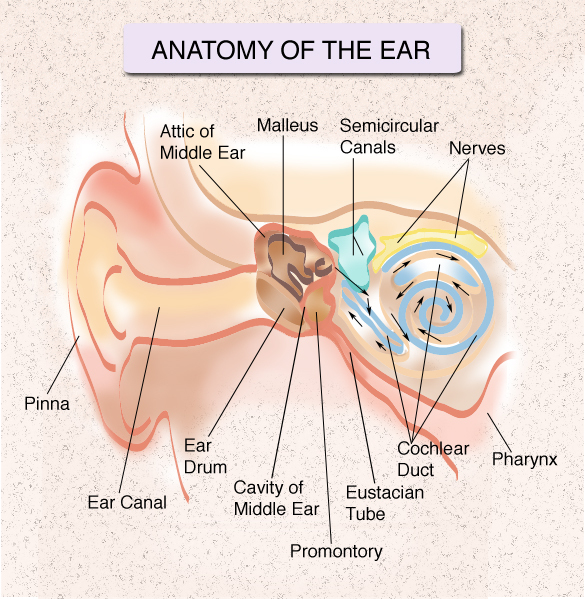 The eardrum is not only a natural barrier to objects entering the ear, but also serves to focus sound to the inner ear. Surgery, usually using a skin graft, can correct the condition and restore hearing loss. At the NY Hearing Center, we perform a physical exam and take your medical history. We will examine your ears with an otoscope, and conduct a series of hearing tests to determine the severity of your hearing loss. We will discuss the best course of action for each individual case and find the least invasive treatment. Treatments can vary from surgery to the use of hearing devices and rehabilitation. In some cases, hearing loss is a temporary and reversible condition; in others, it is a permanent and irreversible one. Knowing the cause of hearing loss helps our staff to determine the kind of hearing loss and what part of the ear is affected in order to determine the best course of action for each patient.